Pharo: Smalltalk, open source, innovative, documented, what else? Smalltalk is real objects technology, not only object oriented, the word of difference may make a world of difference. This means that everything in the environment is an object and the only way to communicate with an object is sending it messages. It's all, objects and messages. In addition all the objects live in an environment (the currently named image) as en ecosystem that is alive all the time. That means that you can modify your objects and the modification happens while the object is alive on the image. These modifications and messages are written in a language. The Smalltalk environment has a language, also called Smalltalk, very simple and easy to learn and understand. The main barrier to people wanting to start with Smalltalk is the Objects paradigm, but after a time changing the mind a new world appear. 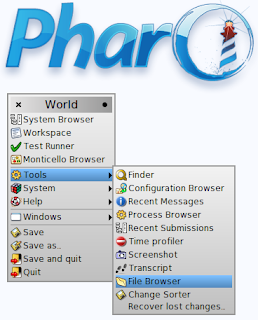 Pharo is an open source implementacion of Smalltalk and the mission stated in its web page is: Pharo's goal is to deliver a clean, innovative, free open-source Smalltalk environment. By providing a stable and small core system, excellent dev tools, and maintained releases, Pharo is an attractive platform to build and deploy mission critical Smalltalk applications. Pharo is currently in the version 1.2.1 as stable, 1.3 is almost ready and 1.4 in development and it uses the traditional virtual machine but also the new, faster Cog virtual machine. The VM is particular to each platform, but the image run unchanged between platforms. A developer could be developing in Mac and deploy in a Ubuntu server with no problems. Also any other combination of supported operating systems. Pharo is ready to develop almost any type of application from desktop to web with plenty of frameworks ready to use. Check here some success stories. The easiest way is download the bundle and click it. But also you can have you VM with lot of different images installed, because the installation is very straightforward, it's only matter of copy the images and sources in a directory, open it with the selected VM and it's all. All the different downloads here. You can use the already compiled vm or compile yourself. For a help building your own cog vm version check my blog post. And if you need help, Pharo have several forums and this free book. What else you need to give it a try?.